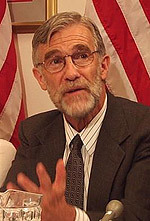 REDDING, Calif. - The public is invited to a free lecture by retired CIA veteran analyst Ray McGovern on Simpson University’s campus in recognition of Constitution Day. The event will be from 7 to 8 p.m. Monday, Sept. 15, in LaBaume-Rudat Hall, room 204, at 2211 College View Drive in Redding. In addition to speaking at Simpson, he will give lectures this month at Shasta College, Chico State University and the University of California, Berkeley. In his role with the CIA, McGovern briefed presidents from the 1960s through the ‘80s. He works with Tell the Word in inner-city Washington, D.C., and teaches at the Servant Leadership School, where he used to be a director. The event is co-sponsored by Simpson University’s History Department and Division of Theology and Ministry in honor of the anniversary of the signing of the Constitution in 1787. Educational institutions that receive federal funding are required to recognize the Constitution during the week of Sept. 17 each year. "Constitution Week is an ideal time to reflect on and reexamine our country's founding documents,” said Cherry McCabe, assistant professor of political science at Simpson. “As a former advisor and sometimes outspoken critic of U.S. policy, Mr. McGovern's perspective is a welcome addition to ongoing discussions of the challenges of democracy in the 21st century." For more information about the event, contact Bill Griffin at wgriffin@simpsonu.edu or McCabe at cmccabe@simpsonu.edu. A map of and directions to the Simpson University campus can be found at simpsonu.edu/map.